Sonja gave a short presentation on Composition at the CQFA meeting on Feb. 2. Sonja is a really good artist and works very hard to get better. In 15-20 minutes, I learned so much about composition that my head was reeling. I talked about it with a number of people that I know. I was really excited. Each of the above armatures can have subcategories. 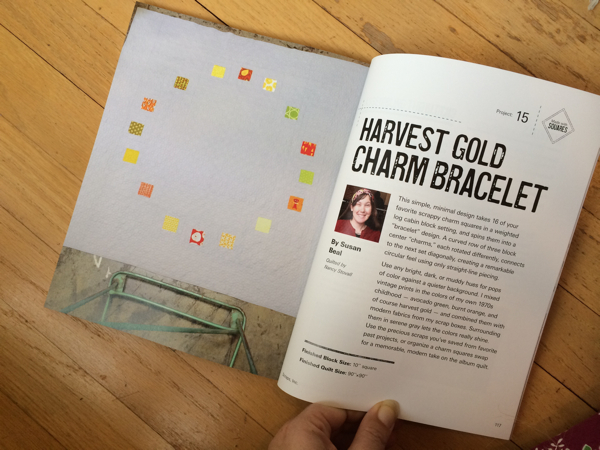 I talked a little bit about this in my Design Series post on Balance. She also told us to work with intention. I took that to mean don’t just slap anything up on the quilt. She said to identify a center of interest and emphasize it, then she told us how. Most of the class was taken up with Value. This started out to be a problem for me. For some time I have been irritated when people have said “Value does all the work and color gets all the glory.” Mostly, this saying has irritated me because nobody who said it could tell me why. I have ignored that saying since the first time I heard it. Actually, I haven’t, but I was doing it intuitively and just using contrast. Contrast has a lot more to it than only value. You can review it in the design series episode on contrast. Definition of Value: Graduations of light and dark. All colors have an inherent value. Definition of Contrast: Difference in light and dark. Or light vs dark. (See The Sharpened Artist). The difference is a mind bender, but there is a difference. Now we can get on to my epiphany. In this presentation she talked about value patterns. She showed a diagram of 14 different examples of values in a composition. 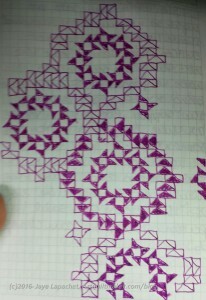 Each diagram shows 3 rectangles on a larger rectangular surface (presumably the paper or canvas or quilt). 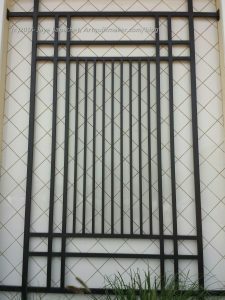 Each rectangle is either black, medium gray, light gray or white. In show different arrangements of these rectangles. Sonja showed us a page in Strengthen Your Paintings with Dynamic Composition. You can see what I am talking about a little bit in the arrangement of rectangles in the example on Jacob Bromeo’s site. You can see how the darker rectangles come forward. There is a lot more I could say about this class. I have some books from the Library. I have some articles to read. 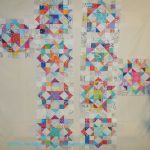 I have some blogs posts to update. Sonja recommended the following books. I got some of them from the library and am powering my way through them. 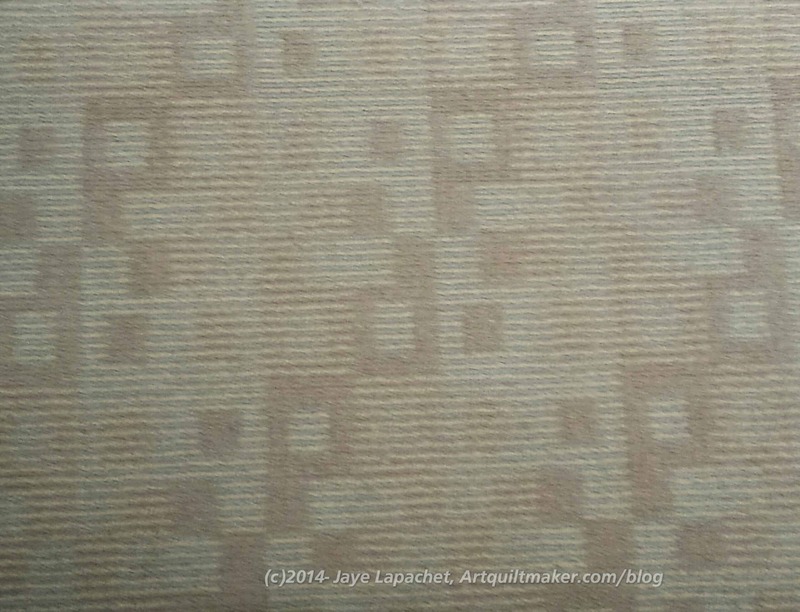 7 Keys to Great Paintings – this one shows a value chart like the one I discussed above. 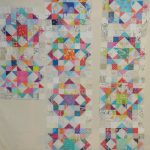 Sonja does watercolors as well as make quilts. The above list is from her watercolor class, so there are things you have to ignore. 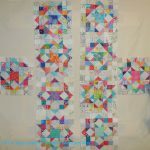 The material on composition and value cross over from watercolor to quilts and are relevant. 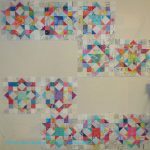 I seem to have a lot of HSTs around. 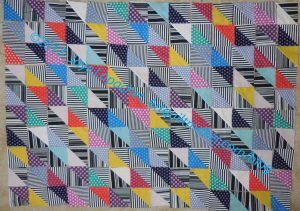 The other day I talked about the Mostly Manor HST quilt. 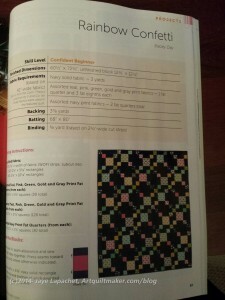 I found the bag of Ta Dots & Stripes HSTs recently and laid them out to see what I could do with them. First, they didn’t turn out as expected. 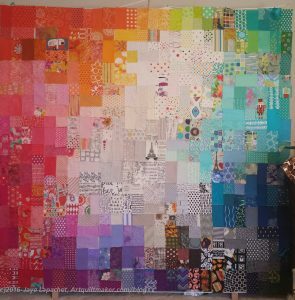 The stripes are a lot darker than I anticipated and kind of dominate the quilt. 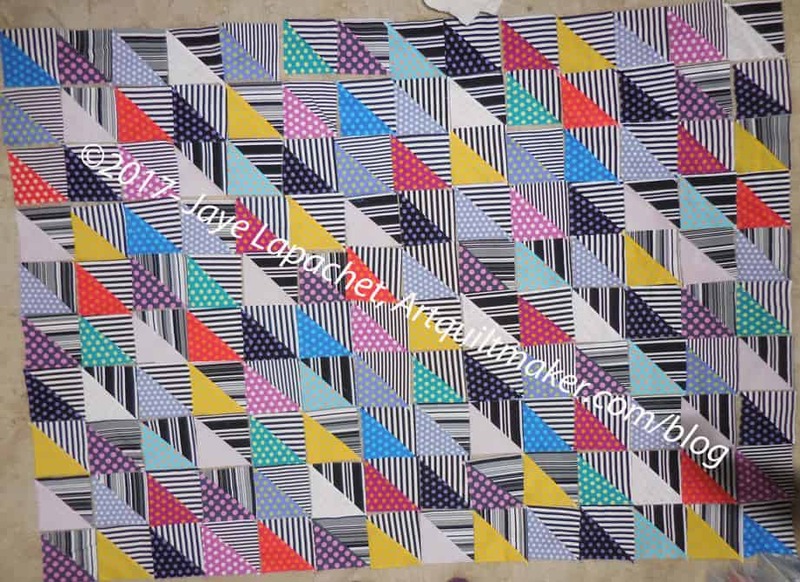 Second, there aren’t as many as I thought, so this will most probably be a lap quilt. Third there aren’t enough colors of dots to make this really interesting. I don’t remember if Ta Dots come in more colors. If not, they should, but these are all the colors I have. I laid them out anyway in order see what I could do with them. 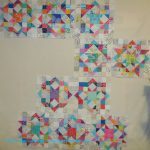 I laid them out in lines and straight HSTs. 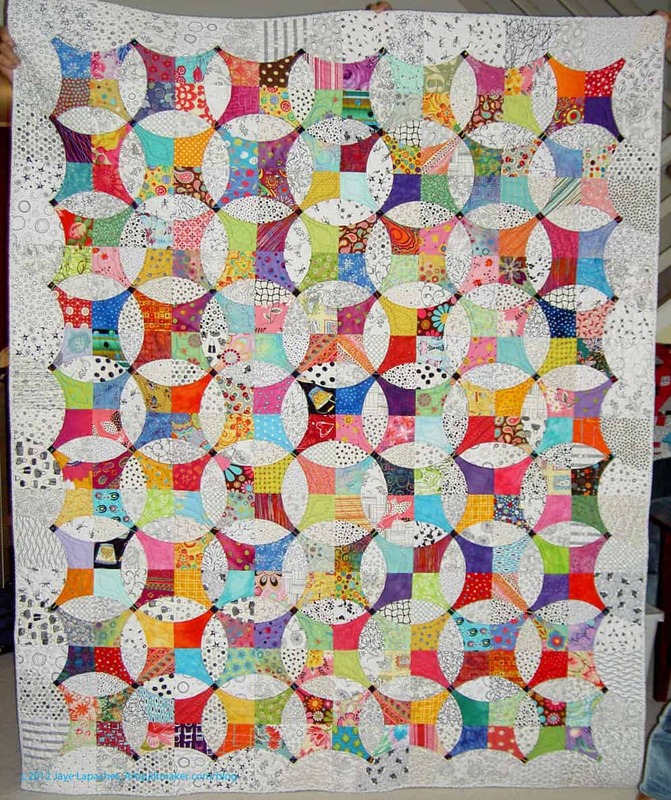 This layout is similar to the one that my SIL did with the Mostly Manor HSTs. 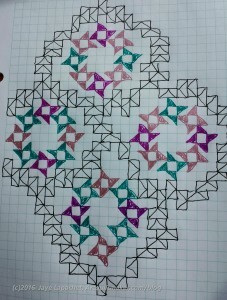 It concentrates the colored triangles together and makes them stand out a bit more. The stripes still fairly dominate the whole piece. 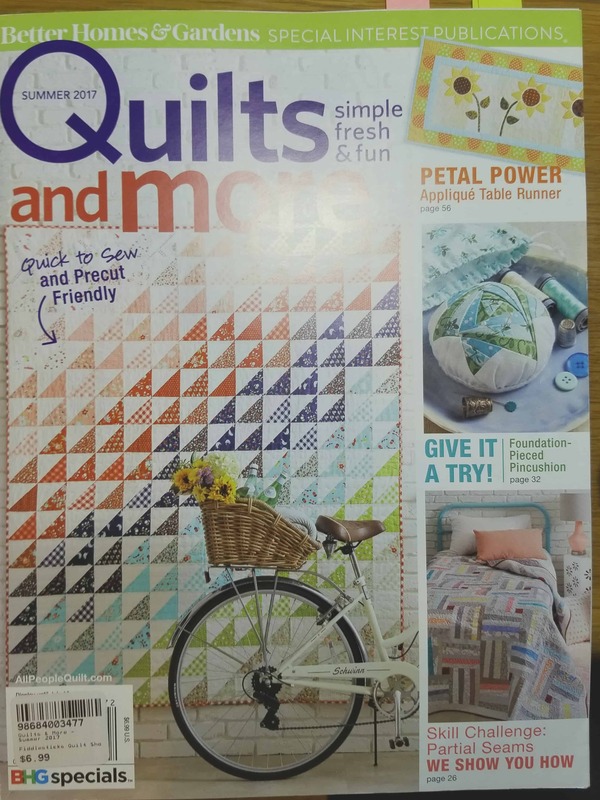 The other layout was inspired by a quilt on the Quilts and More Summer 2017 issue. 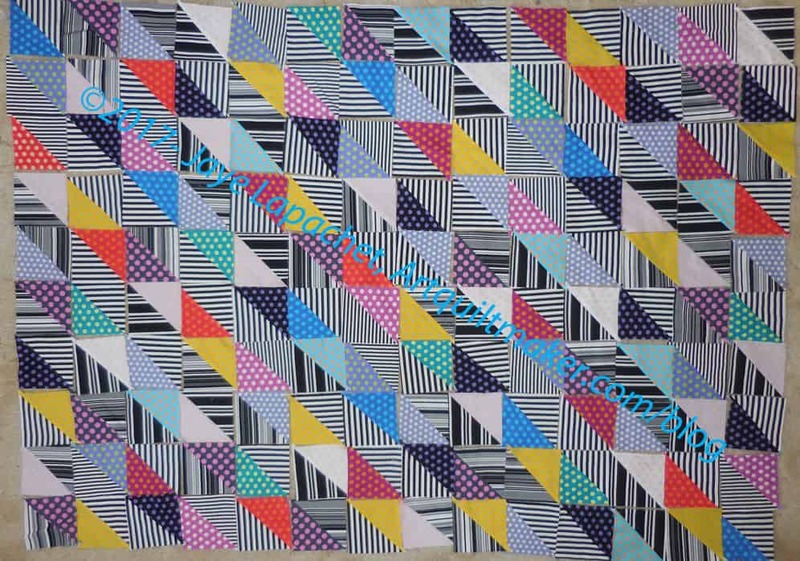 It is straight HSTs in kind of a color order all pointing in the same direction. 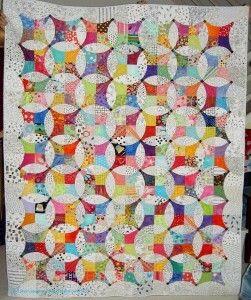 I thought it would be a possibility for this quilt. It is ok, but the contrast is still difficult. 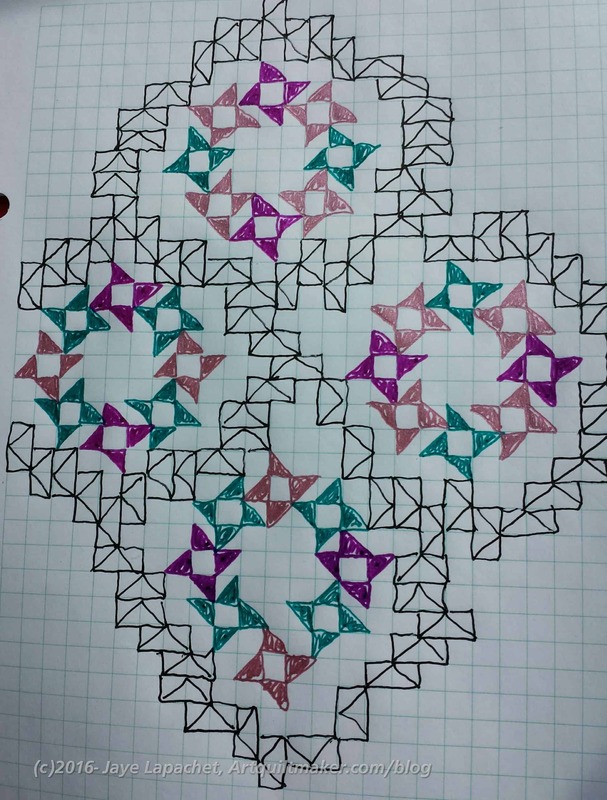 It has been awhile since we did the last design class. There is no podcast accompaniment, but if one becomes available, I’ll come back to this post and link to it. Gradation was the last installment that I could find. You can find the entire series by clicking on the ‘Design Series’ tag in any of the relevant posts. I want to finish the series as the unposted final classes niggle at the back of my mind like a to do list item I cannot cross off. The difference between focal point and dominance is subtle. An element that dominates because of size or color, etc can also be a focal point, but it is not a focal point when your attention is drawn to one spot, but then drifts away because something else is going on in the design field that could be considered as dominant or only slightly less dominant than the element that could be the focal point, if not for the other aspect of the design field. 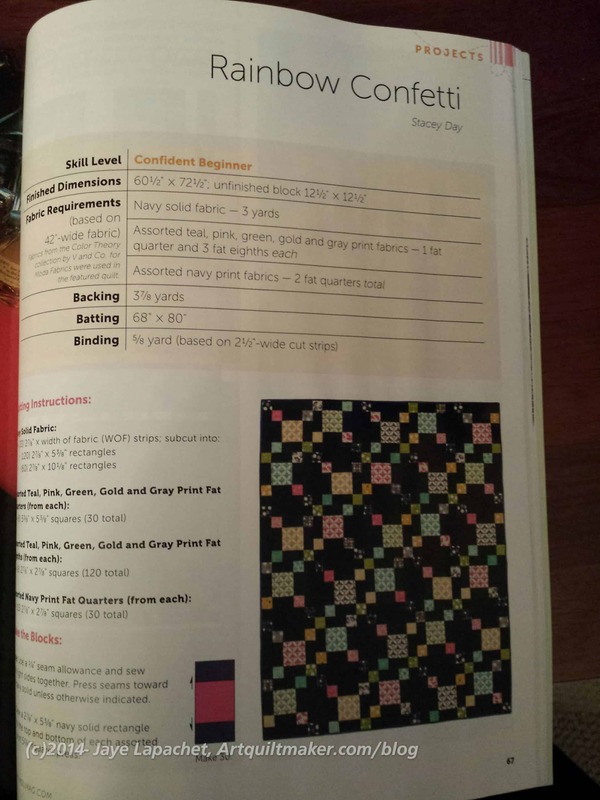 Look at page 125 of A Fiber Artist’s Guide to Color & Design by Heather Thomas for an example. Wayne Thiebaud’s Lunch Table is also an example. 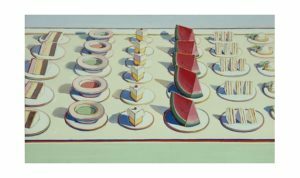 The Watermelon clearly dominates, but not is a focal point because there is so much going on in the design field. The red of the soup helps to draw the eye away. I spent some time over the weekend working on the Stepping Stones. I am ready to just piece without thinking. It never seems to work out, though. I always have to do some deciding or planning or math. This past weekend required all three. 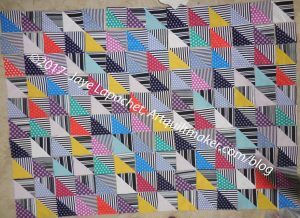 As you might remember from my last update, I had some HSTs to make and was putting it off. 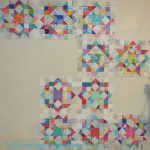 I finally made them when I needed some easy piecing. 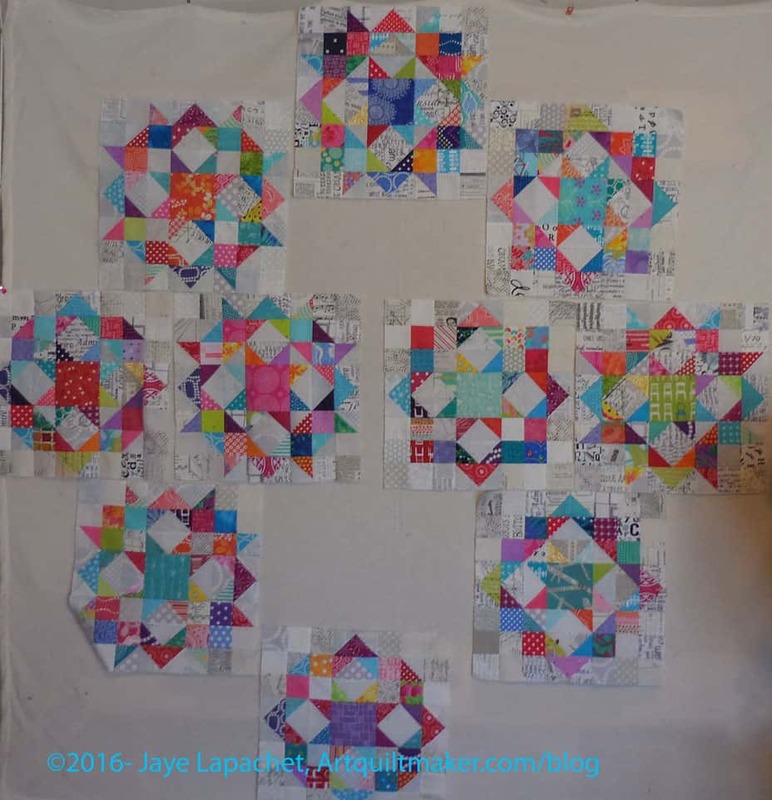 I made a bunch so I would have some choice when I made a few more blocks to complete the top. 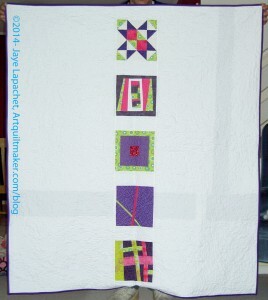 After I made the HSTs and completed the leftover partial block, the question of the border came to mind. I sat down to look at the EQ plan I had and found that I hadn’t completed it. 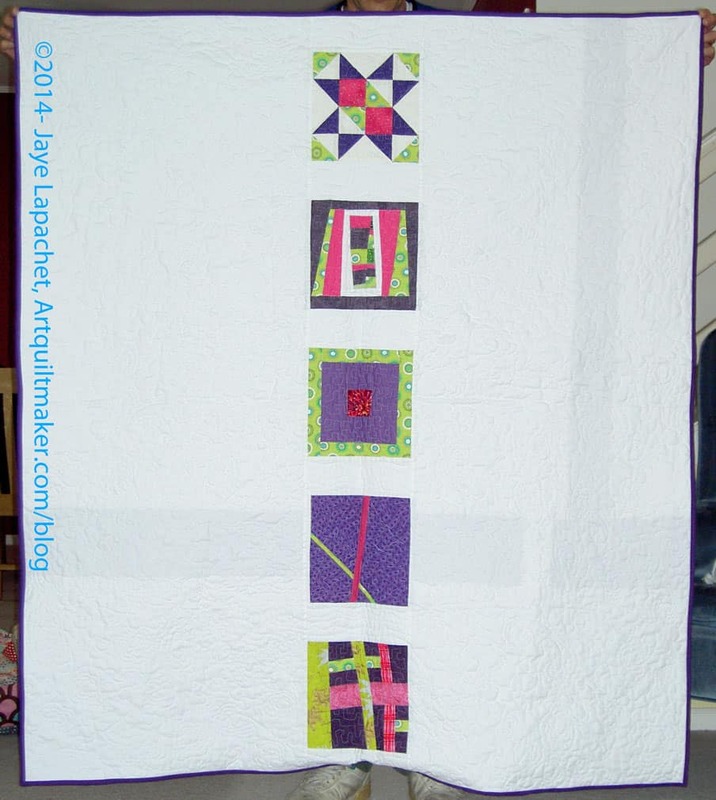 I wasn’t 100% happy with the border I designed for the original Stepping Stones quilt. It is in no way terrible, but I wanted to finish off the groups of squares (red 4 patches set in groups of four, above). I am not sure about the blue/green HSTs in the very corner. 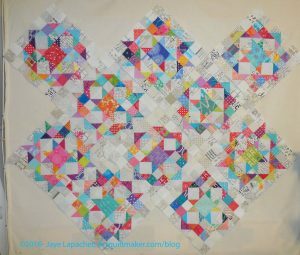 They add a little something, like breaking up a series of squares, but they don’t have any reference anywhere else in the quilt. 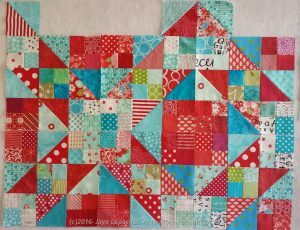 I am absolutely sure that I am happy with the red points that go into the border to finish off the scrappy lines of red that are made of HSTs throughout the quilt. 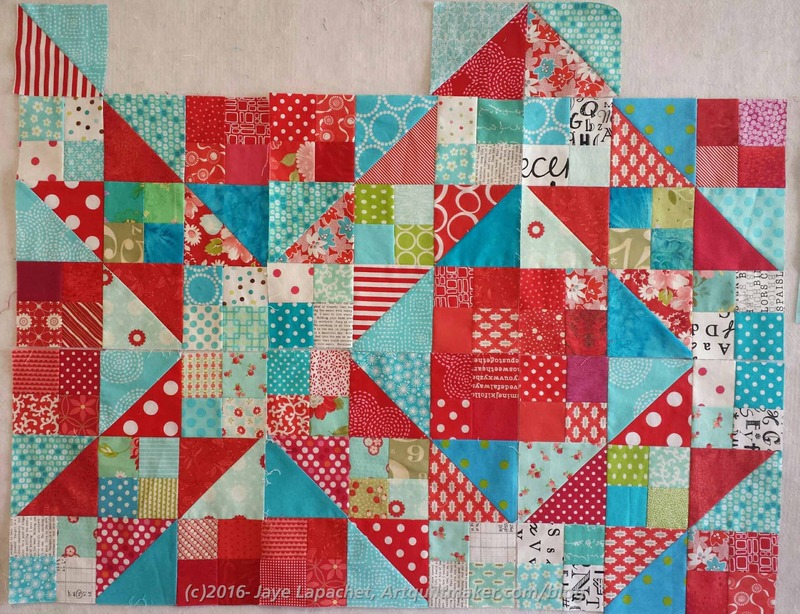 I want to get the border settled so I can start putting the whole top together via chunking. For chunking, I need to start in one of the corners. I know I just posted a few days ago and for you looking at a computer screen the changes to the piece are hard to see. I promise not to give you a patch by patch update. Now is the time where the changes are very subtle and looking for changes in the shape of the areas of color are the best way to See the evolution. I worked quite a bit more on the red and pink areas. 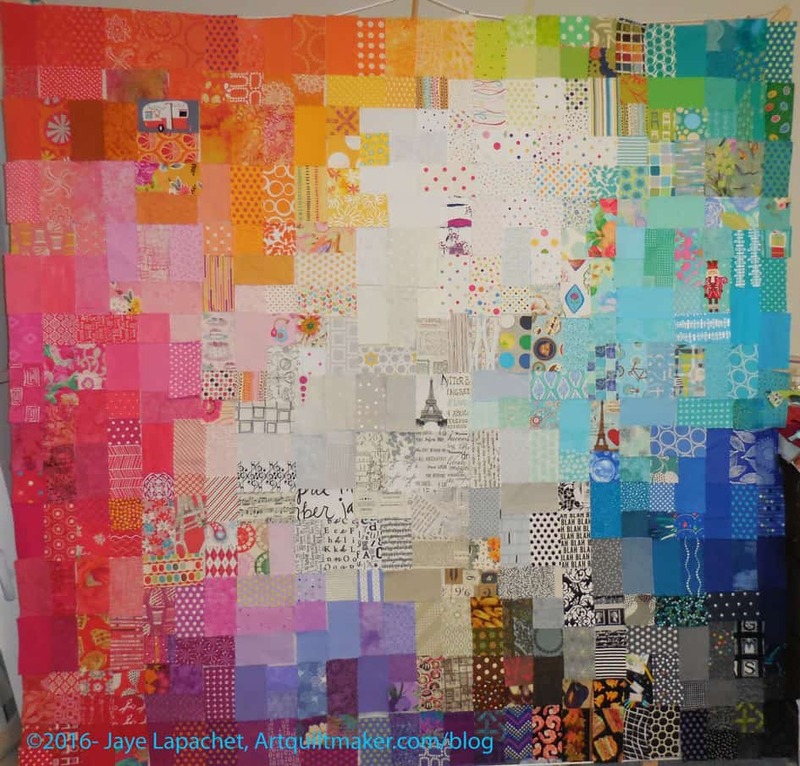 “Working on an area” means getting the darkest or lightest fabrics together and blending the mediums into a smooth transition between the two. Mostly it means deciding where a piece goes. As I have said that is not always easy and in this case, I am struggling with some of the off colors in each area with no way to smooth the transitions. Green is a particular problem for me this time around. Green, never a favorite, has a bunch of grey greens included this time and they don’t seem to fit in either grey or green. That is the way of it, though, and at some point, I have to stop and say enough is a enough. I achieved my goal of getting all of the patches onto the wall last Sunday. I was also able to start rearranging the patches into their final positions. 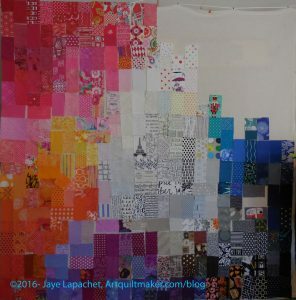 To be honest I have about 5 patches that will not make it on to the front of the quilt. They will have to go on the back. 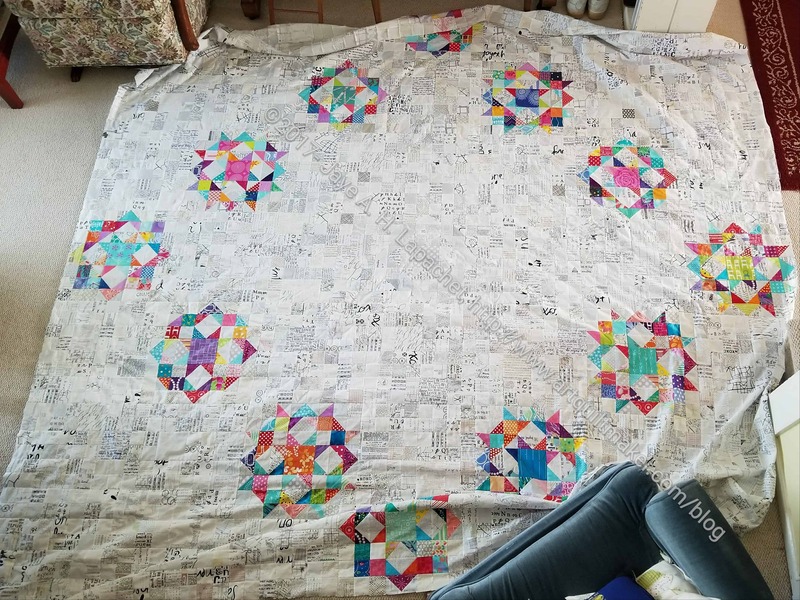 Normally, I wouldn’t do that, and I don’t really like it, but I would have to cut about 22 additional patches in order to fit them into the quilt. I think putting 5 on the back is the lesser of two challenges. Also, the process is evolving and I am thinking of this as evolution. As per usual, there are patches that are not in the right place. Moving the left side around gave me the advantage of putting that section into better, not perfect, but better, shape than it would be normally. If you have ever tried to blend (gradate? Colorwash?) 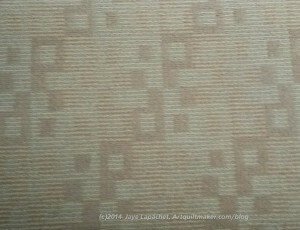 commercial fabrics into each, you will know it is not an easy task. It is a struggle and I am at the point where I wonder why I do it. Still, I see the value and will continue on. In between other things going on here in the Artquiltmaker Workroom, I wrote the book review of Scraps Inc. As you may have read, I was lukewarm about the book in general, but everything can provide some inspiration. 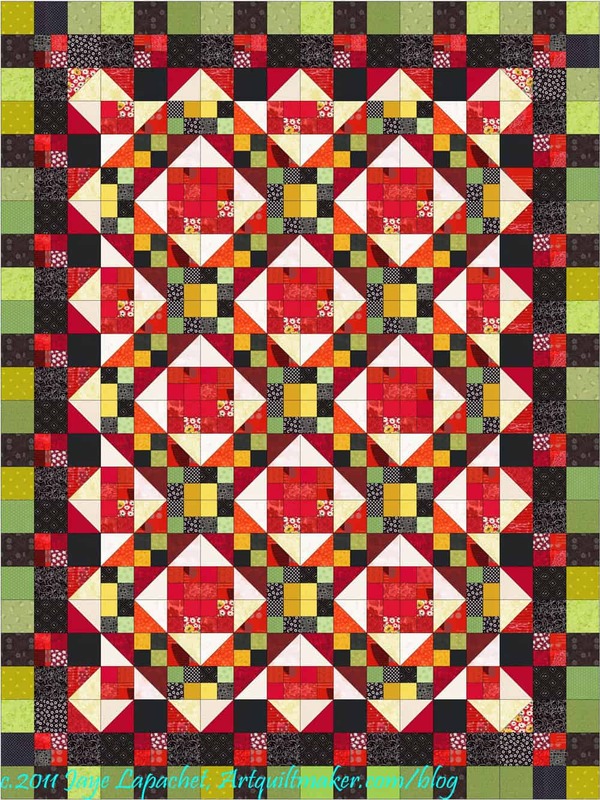 One quilt (from the related blog post) that I didn’t think should be included in the book** provided inspiration for the Carpenter’s Wheel layout, however. I don’t think I have quite enough blocks to make this layout work. I can’t really tell since the design wall isn’t large enough to give me a good sense and the proportions of this layout are off. I might try it on the living room floor since I can see it from the upstairs hallway. My SIL suggested a regular on-point 3-2-3 layout. I tried it. This might work without the bottom two blocks, but with those two blocks, it looks crowded and odd. 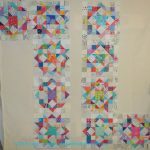 If I do this layout, what will I do with the bottom two blocks? I have more work to do on this piece, so stay tuned. 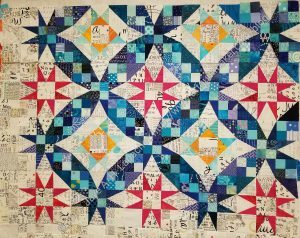 **Nota bene: There is nothing wrong with the quilt and it is very modern, but it uses very few scraps, thus I didn’t think it fit the definition implied by the book. YMMV. I worked a lot on the piece over the weekend as well as on and off during the week. these blog posts are a little behind my actual process, so you can follow me on Instagram (check the sidebar) for more up to the minute news. Even though I was on the fence about this year’s edition, I am enjoying the process. 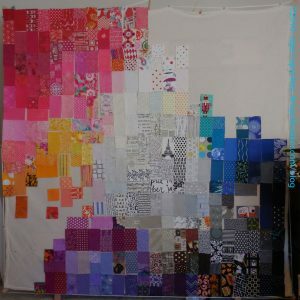 This is the ultimate in scrap quilts, even if the scraps were cut from yardage specifically for the process. 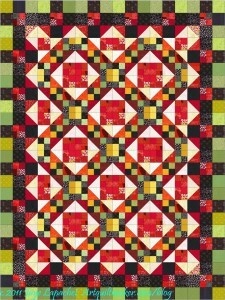 Perhaps, more accurately, it is the ultimate in charm quilts. I thought my first pass was really good, but as I walked around and past the design wall, I realized that the transition from dark to orange wasn’t working. I looked at FOTY 2013 and saw that I had transitioned from dark to red. That meant moving all of the pieces on the left side and reversing their positions. I am trying to enjoy the process, a constant battle because the next project is always newer, fresher, more fun. Moving a few hundred pieces was not my idea of a fun day. That dreaded “it will be fine” phrase popped into my head and I knew I had to just start taking pieces off and repositioning them. This exercise actually turned out to be a good one. I was able to restack the color groups and think about them again. 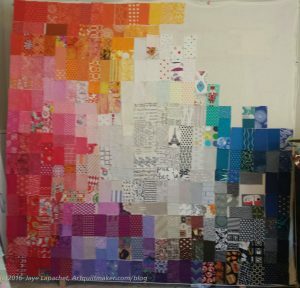 I looked at the pieces in each color group in relation to each patch. 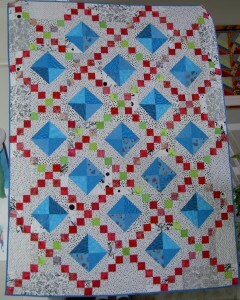 I used it as a way to further refine the layout while the patches were off the wall. I think this was valuable, as the left side looks a lot better, not only because the red is at the bottom and lighter colors more towards the top, but because the placement of patches within each color family is better. My next goal is to get all the patches on the wall. Lots of design work going on in my workroom. Before I allowed FOTY 2015 to take over my design wall, I did a little bit of layout design with the Carpenter’s Wheel blocks. 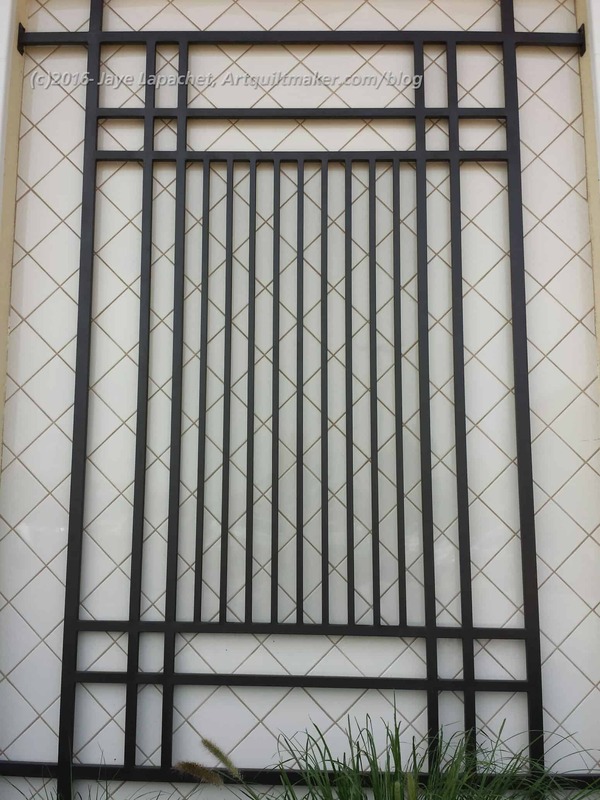 I don’t want the layout to be a straight block layout. I am willing to piece a bunch of low volume alternate blocks if I need to (rote sewing- YAY!). 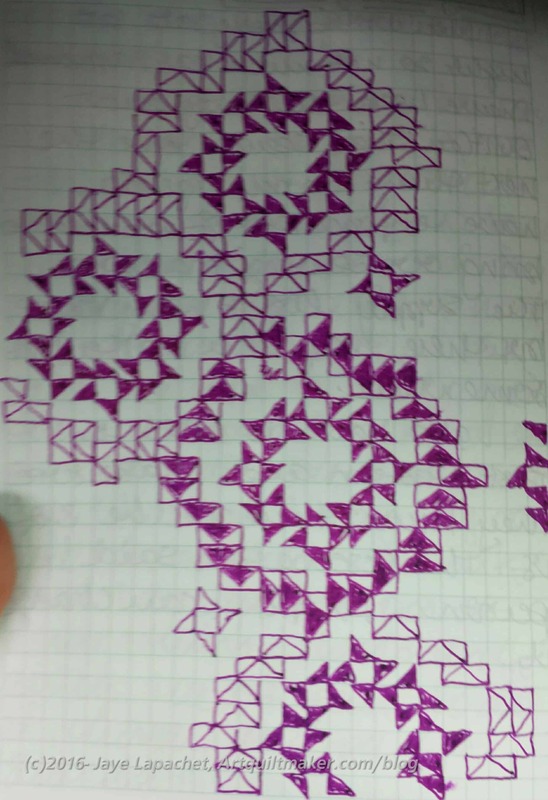 I only have 10 blocks, which adds to the design challenge. 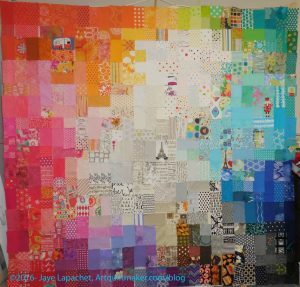 I was first thinking of designs that were similar to a donation quilt that Kathleen and I made. It was all Kathleen’s idea, but I happily went along. 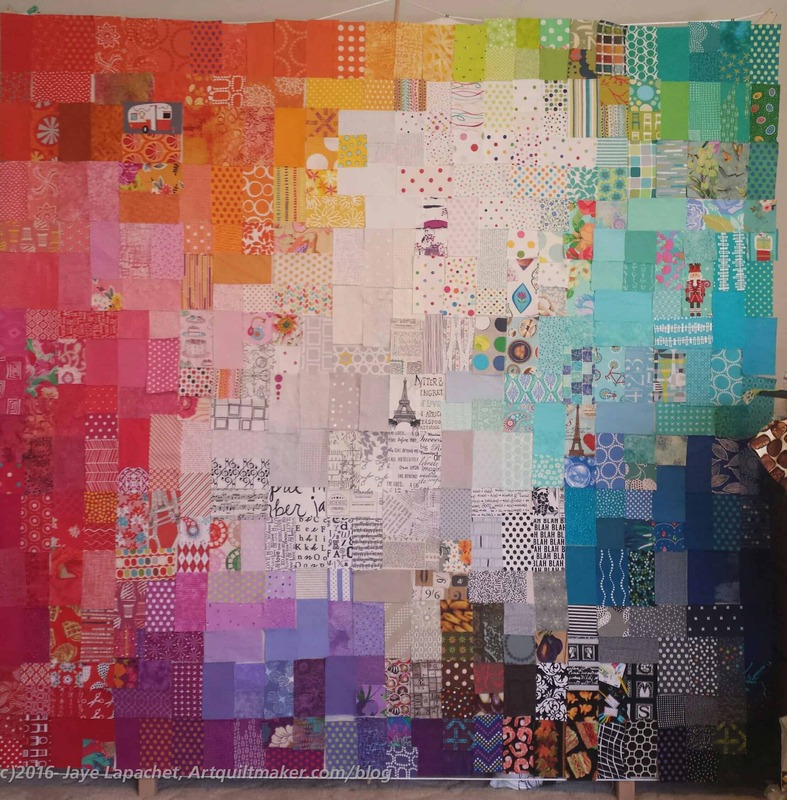 Donation quilts, as I have said about 12 million times, are good for trying out new ideas. I wanted to stretch myself with these blocks. 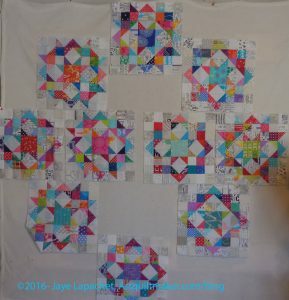 I like the linear effect of the donation quilt and wondered what I could do with the Carpenter’s Wheel blocks that would give the same effect? I tried out different linear type layouts. Of the above, #1, #6 and #7 are my favorites. I like the idea of giving these blocks some space and all of these layouts give the blocks space. 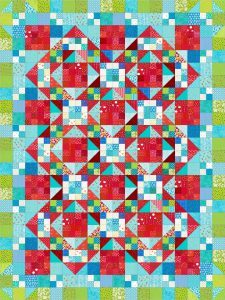 That might not be the case with alternate blocks made up of low volume prints, however. I might be able to mitigate it by not including any patches that have a large concentration of black. We’ll see. I may need to do a test block. #1 is a bit too symmetrical and I wonder if that layout is not stepping out of my comfort zone enough? Back to the design wall, I think.